Once again, I apologize for these pictures coming so late, but I was at home this weekend and I did not get a chance to post them before I left. 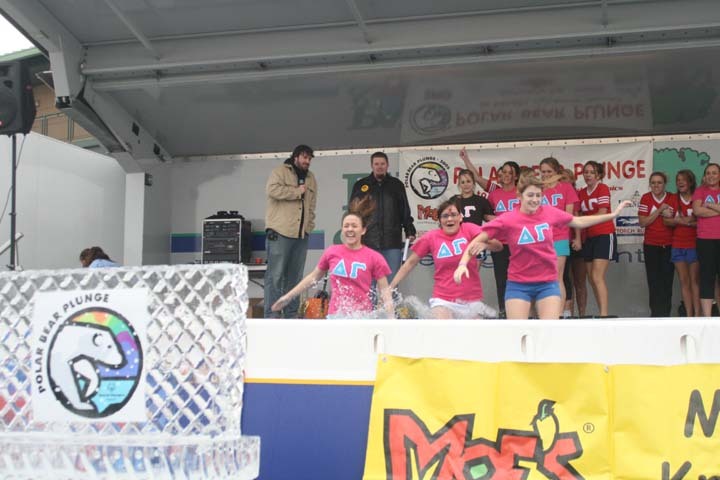 On Saturday, January 26 (again, sorry) I went to the 9th Annual Polar Bear Plunge. 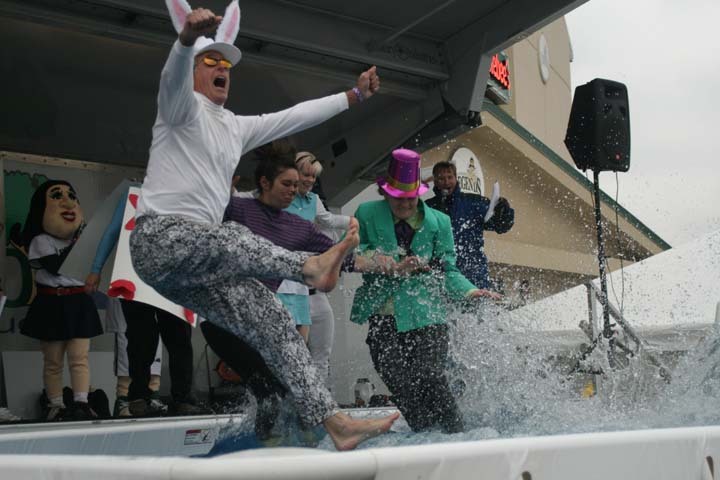 There are five Polar Bear Plunges in Kentucky. Lexington’s version was held at Apple Bee’s Park, home of the Lexington Legends. 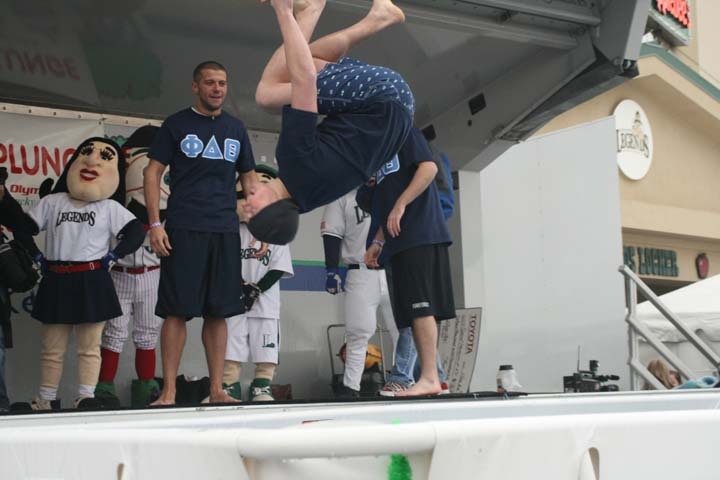 Participants raise money that benefits the Special Olympics and then jump into an ice cold pool (or the Ohio River in Louisville’s case). Now, I realize that it is for a good cause, but those people are crazy!!! I stood outside in the 35ish degree weather in my heavy coat for about an hour and a half taking pictures, and I was COLD! After looking through my pictures with Ed, I do have some regrets. As you will see, most of the time, I was standing just to the left of the stage. Ed pointed out that the background is a little too busy. I should have staked out a spot in front of the stage earlier, but I made the mistake of congregating with everyone else, so I was lucky to be in the front row at all! After the crowd thinned out, I moved towards the center, which you can see in the above photo. Ed also suggested that I lift my camera a little higher to show the water line so that you could tell it was a pool rather than a trampoline before participants hit the water. Overall, it was a very good “go off campus and take pictures for the paper” experience, and I really like the pictures I came away with. Below: Ice Sculpture in-the-making of, what else? A polar bear! Staff from Mellow Mushroom dressed up as characters from Alice in Wonderland. UK’s Delta Gamma sorority, which was featured in my Kernel photo. 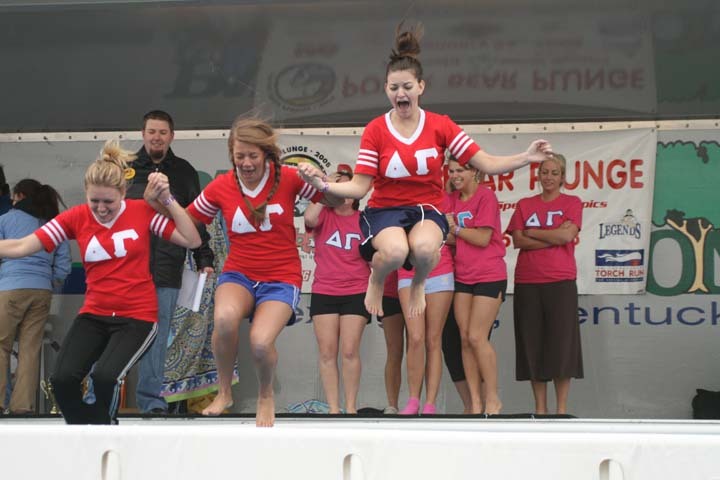 The 34 sorority members raised $1700 for the Special Olympics. 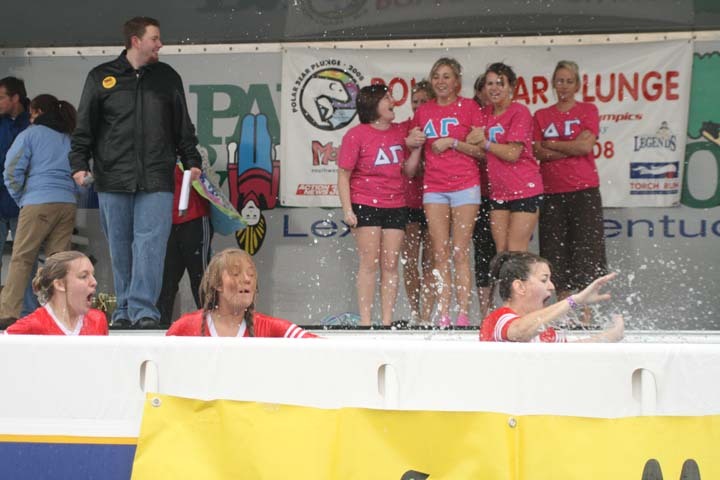 Wondering what those girls from the Kernel photo looked like after hitting the freezing cold water?